Dr. Gill and Dr. Chambers arrived with surgical kits, equipment and advice about how to engage the hundreds of Hall County students who will take field trips to the museum. 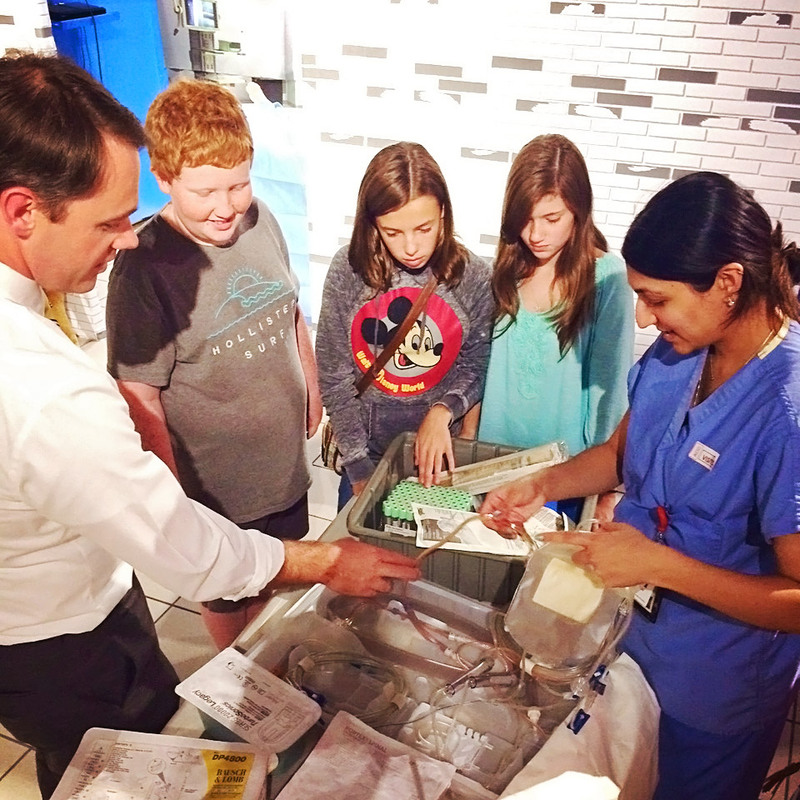 The doctors showed the kids how to drape a patient, talked about all the tools they donated to the display and gave ideas on how the students could give a more interactive and realistic surgical experience for museum visitors. “This is so cool,” exclaimed DVA seventh grader Carson Whitt. The upcoming exhibit focuses on the human body,which is being brought to life by a boxing ring that sends messages to the brain, a colon you can travel through, displays about the skeletal system, the mouth and more. Students Caroline Odell, Callie Kirby and Carson Whitt-who all aspire to be doctors one day- chose to take museum visitors on a tour of an operating room and explore the inside of the human body. Every semester, DVA students break into small groups to create and curate their own exhibits, generating many displays exploring one central theme. Once the displays are complete, local elementary schools bring hundreds of children through the museum to learn from the middle school docents. The DVA students get to explain and share all they have learned by putting each display together. 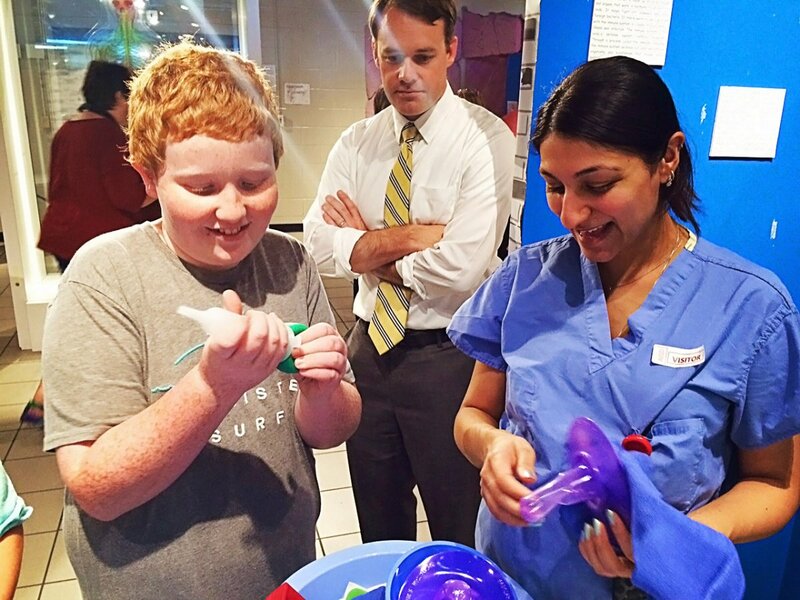 “NGPG Surgical Associates is proud to be the sponsor of such an amazing exhibit and provide tools for the children to better understand the human body, surgery and the operating room,” Dr. Chambers adds. The DVA Human Body exhibit will be open to the public October 15 from 4 – 6 PM at 3215 Poplar Springs Road, Gainesville, GA 30507. NGPG Surgical Associates is an affiliate of Northeast Georgia Health System. Learn more about the practice at ngpg.org/general-surgery. Northeast Georgia Physicians Group (NGPG) brings together more than 250 talented physicians, physician assistants, nurse practitioners, midwives and other clinical staff representing more than 20 specialties at more than 80 locations across North Georgia. Learn more atwww.ngpg.org. NGPG is affiliated with Northeast Georgia Health System (NGHS), which serves more than 800,000 people in more than 13 counties across the region. As part of NGHS, patients of NGPG have a direct connection to NortheastGeorgiaMedicalCenter – Georgia’s #1 Hospital (CareChex®). Learn more at www.nghs.com.